No Tougher Duty - No Higher Honor: From Iraq to America, a Healing Journey in Writing! The Zbooks successful authors' podcast is where Bestselling Author Eric Z talks about Independent Publishing, CHALLENGES, and whatever we feel like, with the BEST Authors in the WORLD! The Machiavelli of Amazon Ads and MORE : Brian Berni! The man behind the scenes - the MASTERMIND, is from Italy, he worked in the Vatican, and his name is Brian Berni! Brian has teamed up with some real Heavy Hitters: Derek Doepker and Matt Stone - to bring Indie-authors the best advertising or "done for you" books ads on the market. BookAds.co! Through their combined market savvy and insider knowledge they have built an awesome Amazon Ads service that BLOWS AWAY the competition. Brian has also hosted an AWE-SUM Author summit! Running in Silence - Running to Victory: Interview with Rachael Steil! Writing Killer Thrillers with Mark O'Neill! Mark O'Neill's Heroin is an utter *****! Join us as we talk about PANTSERS vs OUTLINERS and why female ASSASSINS are awesome! Making a Difference with our ELDERS and VERONICA KIRIN! This is a #SUPER #DEEEEEP dive with Derek Doepker on Amazon ads! Derek has helped other big gun Authors like Steve Scott maximize their book sales with Amazon ads... What a RICH episode! Learn about the 4% RULE - profound! The FLOW STATE How to A-B test Your Amazon Ads The ABC's of your Book's Title and Sales-Page on Amazon What is going to Change in the Book World How to Zig when everyone else is Zagging The new CURRENCY How to get peoples attention (Secret Hack!) "When everyone is zigging -- it's easier to zag!" Check out Derek's Amazon Ad training KD SALES MACHINE! In this Episode Eric Z goes on a deep dive with C.S. Lakin about the NARRATIVE breakdown, and why it is so DARNED important to get it right! Also why it is so important for beginner authors to have their book professionally critiqued by and EXPERT in the field. [so you don't waste time, and instead, get started RIGHT!] Why is this the most valuable podcast? #1 - CS Lakin has literally TONS of resources on her website for FREE (not even an email required!) These include TEMPLATES and Outlines and checklists and, and, and! EXACTLY what the beginning author needs to look at and USE FIRST. I mean really...first! Also, if you listen to the end, there is a DISCOUNT code for one of CS Lakin's SUPER VALUABLE course. I wish I would have discovered her website BEFORE I started my book! 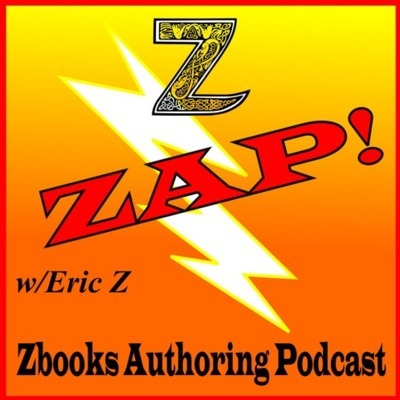 In the latest episode of Zbooks Successful Authors Podcast Eric Z explains the how's and why's of podcasting and... Why you especially need to start a podcast—as an author. The BEST platform— that broadcasts automatically to 11 different BIG platforms like iTunes, GooglePlay, and and and... KILLER tips on the technology and sound recording required. An awesome way to put a book together—FAST! A Mic CHECK - I switch mic's to demonstrate the difference in quality between a good mic and a cheapo mic. And even a killer tip for GENERATING more TRAFFIC to your podcast! Go To http://bit.ly/y2pod for the presentation to this podcast - no email required! I had the wonderful opportunity to interview Harald Johnson, a Historical Fiction MEISTER! Harald has many years of experience in so many topics, it's impossible to cover them here. Listen in as he unfolds the RICH History of New York, and at the same time, how to "do" Historical Fiction right. Harald has a depth of experience that I have rarely encountered before. From Marketing, to Design, and of course writing CAPTIVATING books (!) well...we will have to do another podcast to cover the rest! Topics Covered: · Bookbub ads · Marketing (media director?) · DPI vs Pixel mass/dimensions – Printing industry · The perfect Ebook cover dimensions · KDP select vs “going wide” · Traditional Publishing vs Independent Publishing (Hint: Indie Kicks Trad’s arsch!) · The Concept is NOT the premise · Amazon Ads (AMS: Amazon Marketing Services) · Pay Per Click Advertising · “Trickle” ads with minimum bids · Fiction vs Nonfiction characters · Outlining · Henry Hudson · East India Company vs West India Company · New Amstersdam vs New York · Dutch vs British colonists · Manahatta: The Island of Many Hills · Algonquin speaking Lenape Native American Indians · Jamestown · Beavers J · Swimming the Hudson! · Book promotion · Quora ads · The New World movie with Colin Farrell, Pocahontas (Q'orianka Kilcher) · Stephen King’s “11-22-63” · Split timelines · Ken Follett · Chapter length vs Scenes Enjoy this deep dive into everything from marketing books to Pocahontas! I Met the Muhammad Ali of Ebooks and survived! Most AWE-SUM interview with Steve Scott! How do you become an Influential Author? Gregory Diehl has traveled more countries than Tim Ferriss AND has been dominating the Business Categories of Amazon.com for over 1 year. Listen in as Eric Z gets the full report from our Traveling Influential Author! Since Amazon has "kicked" the 3rd parties from their API, and made it impossible to contact reviewers, the "easy" way to get reviews is GONE. GREAT! The mother of invention comes on cue and a new service fills the void! VORACIOUS READERS ONLY .com Listen in as @ErocZ of Zbooks.co takes a deep dive with Larry Froncek of VoraciousReadersOnly.com on: --Getting reviews --Entreprenuers --Facebook Ads --Building a Business --Book Promotions7 --Validating a product/sercies --Email lists and list building --A-B testing book covers --Book blurbs, log lines, hooks Check it out at www.Zbooks.co ! Zbooks + Simon Whistler - The #ZEN Master of Audio Books! This is the first Zbooks podcast and I was lucky enough to get Simon Whistler for the interview! In case you don't know Simon Whistler, he is the Zen Master of Audio books, those are my own words of course. Listen to the interview for HIS own words! In his Rocking Self Publishing podcasts he has interviewed over 100 successful authors, so if you are interested in super interesting interviews and LEARNING from the most successful authors in the world, I highly recommend you go to his website: http://rockingselfpublishing.com/ and start listening to his interviews! Next week I interview Mike Shreeve and we finally get those Facebook ads right! Indomitable Spirit, Motivational Books, and Charity: Interview with David Bird! Meet Anita Rodgers - Crime and Mystery Author from California! Go on a deep dive with Zbooks and Anita Rodgers! Successful Crime Series Author - NOT an easy thing to do - listen in as she gives her insider tips and techniques. Goodness Guaranteed! The James Bond of Independent Publishing! Tyler Wagner on the Zbooks Successful Authors Podcast!